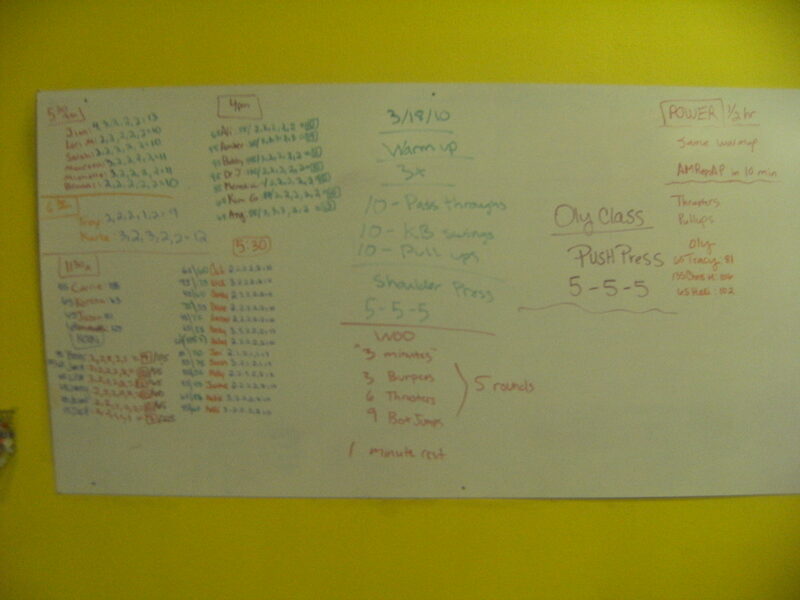 The problem (good problem to have) with CrossFit is not lack of motivation but TOO MUCH motivation! It is easy to get hooked on doing two-a-days, working out everyday, and neglecting to rest and allow your body to recover. If this sounds like you, then you maybe guilty of OVERTRAINING! According to Wikipedia: Overtraining is a physical, behavioral and emotional condition that occurs when the volume and intensity of an individual’s exercise exceeds their recovery capacity. They cease making progress, and can even begin to lose strength and fitness. Overtraining is a common problem in weight training, but it can also be experienced by runners and other athletes. Here are some sure fire signs that you may be overtraining…and if you are STOP, DROP, AND REST! 8. You feel like crap the hours and days after a big workout. This entry was posted on March 18, 2010 at 11:34 pm and is filed under Crossfit Philosophy, CrossFit Workouts, Lifestyle, Nutrition. You can follow any responses to this entry through the RSS 2.0 feed. You can leave a response, or trackback from your own site. I was just saying to myself how much I miss crossfit – I have missed the last 2 weeks and will probably miss next week as well. I love the addicting adrenaline rush and how quickly my body responds. However, I think I can safely say that on most weeks I am an overtrainer and have a bit of a dependency issue when it comes to exercise. I can relate to about 3 of the items from the article. I have stopped seeing progress on my running times and some days am just too darn tired to do what I expect of myself. So although, I love crossfit and can’t wait to come back, I truly believe that everything happens for a reason and that I really needed to take a few weeks off, from 1 of my 2 gyms. Miss you all and see you in a week or so. This is a great blog post. Sometimes people who are trying to lose weight/get quick results tend to overtrain and not eat enough calories to sustain themselves, when this is the worst thing a person could do. This happened to me a few weeks ago. I was doubling up on Tuesday/Thursday (WOD and OLY) and my body was just run down by the end of the week. Listen to your body…it will tell you when you need to rest. One thing that may be helpful is “active” rest if you feel you “have” to do something on your off day. Work on stretching and mobility exercises to keep a slow dripline of Kool-Aid flowing in your body. I did this tonight and it felt AWESOME when I was done! i’m not full time – just do 3x a week and i still feel like this. i’ve had terrible performances for weeks but if i take time off i feel like i get kicked harder when i come back. can a part timer be over trained? and yes i’m looking for responses. i have over half of the items listed above but i feel like i should be able to sustain 3x per week w/out feeling this way (and yes, i’m eating enough – and the right foods). everyone keeps telling me to take a break but i have a day off between most WODs and have the weekends off and don’t do much in between. maybe i’m getting to much rest – is that even possible?? help……. I agree with Jeri and have the same question…. can a part timer over train? My struggle- Sometimes feel like I need a bit of a break, but when I do I feel like I hit “rock bottom”. So I struggle with finding the right balance. Hmmm…… I took this week off… but off of everything. Was sick, so no work, no CF, no coffee 🙂 no anything…. and this week I feel pretty good (except the sick part.) So, did I just need a complete break to re-engergize? So how often do you need to do this? That said- I did CF 4x/wk a couple times and then felt unbelievable energy. So, maybe I am not consistently finding the right balance? One thing I am learning is my max on certain lifts, etc. When I over exert on them (too much weight, etc.) then I pay for it for about a month or so. When I focus on the form v. weight/strength, I feel challenged and good, but like I let myself down. Basically- finding the right balance is tricky…. overtrain or undertrain and when to rest???? Yes, a part-timer can lead their body to overtraining. It’s not just exercise that creates this problem. It’s accumulation of stress in your body that eventually tears it down. If you aren’t sleeping, and are eating bad food, working too much at your job, working out too much, fighting with your significant other or spouce, friend, etc, then you are more likely to start having these symptoms. I have a lot of experience with this. I broke my entire endocrine system last spring and summer from too much stress (working out 12 hours a week, eating bad food, working ALL the time, being a single parent, etc) and definitely not getting enough rest. It was one of the worst (and eye-opening) experiences in my life. I didn’t listen to my body, and it took me 4 months of rest, just to have the ability to walk up a flight of stairs without being completely gassed. If you are starting to feel overwhelmed, then start monitoring your resting heart rate when you wake up. If you start seeing a noticeable increase… scale something in your life back. My resting heart rate jumped to over 100 bpm and it would pound so hard in my chest! It was a very scary experience which cost me a lot of money in doctor bills!! Also… I think it’s a good idea to start monitoring your blood pressure for postural hypotension. If your blood pressure is dropping when you stand up (making you very weak and dizzy), then you should start scaling back. My blood pressure would drop 25 points (it should increase when you stand) and I would constantly fall down… a good sign that I needed a REST. And sometimes 1 day of rest won’t cut it. Take the weekend off (I schedule these in quite a bit), or better yet… take the entire week if you have to. Recharge and when you come back, you will see much better progress with your workouts (and your emotions), then if you keep struggling through day after day. I’m probably not the best person to answer this because I tend to be an overtrainer between my sports and CF but I find that when I take too long off, I feel worse and have a tougher time coming back than when I do 2-3 days in a row. I too am a part timer but for myself, I find that if I do a “mini” workout at home, it keeps my energy levels up. Now, a “mini” workout to me and a “mini” workout to you may differ but for example, I’ll pick something I don’t mind. For example, while watching tv, I may do 100 situps and 40 25lb DB push presses (each arm individually) so I mix it up a little. Or lately, I’ve been trying to do my 10 min pilates tape. For myself, unless I don’t have 15 min or so (or unless my muscles are too weak), I’m doing a little something every day even if it is just situps, which I LOVE! I don’t know if that is why I don’t feel like I’m overtraining or not but that’s what I do to help “balance” things out. I certainly don’t pretend to know what would be helpful for ya’ll! But, for me, yoga has been a great complement to Crossfit. I was just talking with Chris about this, and yoga has helped prevent injuries and work out sore spots in my body, post-CF. It’s helped me breathe more fully and take in more oxygen during WODs, and if you practice power/vinyasa yoga, you’ll gently raise your heartrate. It’s great for creating a strong body and quiet mind. When I alternate yoga and Crossfit, I find I look forward to both. When I do too much of one thing, it starts to wear me (and my muscles!) down. This is a GREAT topic to discuss. I hope other people will share their tips!!! funny you should mention yoga as i was talking to someone about this at work today and though maybe i should throw that in (or crossflex if i could get away from the office during the day). Sorry ladies I don’t think it is possible to overtrain going 3 days a week. However sometimes people need to just take a week off and not do much of anything except some “active rest” everbodys body is different and you need to listen to it. Otherwise maybe you need to switch up your routine. If you go Mon, Wed, Fri try going Tues, Thurs, Sat.